In the first of its Pre-Dinner Concerts MusicFest Vancouver presented an impressive and charming concert by the World Vision Korea Children’s Choir. Industrial Alliance Pacific is sponsoring these Pre-Dinner Concerts which feature a variety of musical morsels. The World Vision Korea Children’s Choir was formed after the Korean War, and has since been spreading it message of hope, love and peace throughout the world. 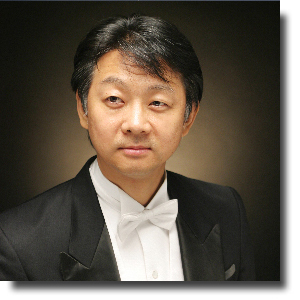 The Choir is comprised of three dozen talented young teens, singing the compositions of Hyun Chul Lee under conductor Hee-churl Kim (pictured) with Chang-eun Kim providing piano accompaniment. Their musical trainer is Kyoung-ha Persaud. This Vancouver performance was the first in a 17-concert tour of North America. Throughout the two-part concert, this group of talented young performers surprised the audience time and again. In the opening Kyrie and Gloria, the choir exhibited its mastery of euphonic traditional Korean harmonies, in a disciplined rendition of Lee’s composition of the prayers. Their second piece, Mountain Flower, showed the choir’s keen ability to evoke tender emotions through harmonics and tone. Then came The Children. Simple special effects, wailing, and movement, combined with brilliantly executed harmonic and discordant elements, shocked spectators with a tribute to children of the world who face war, disease and starvation. A joyous and swinging rendition of George Gershwin’s Clap Yo Hands followed. Perhaps the most moving song of the concert was Peace, a beautifully harmonized expression of hope and joy in the elusive vision of world peace. Jubilee was a fun closing to the first part of the show. The second part was a colourful cultural treat. Dressed in traditional garb, various parts of the choir showed the breadth of their skill and talent with traditional rhythmic drumming and dancing, and a poetic, beautifully sung and choreographed fan dance. The choir closed their performance with evocative folk songs from Korea, again showcasing their strong voices and remarkable harmonies. This polished, all-too-short performance by the World Vision Korea Children’s Choir was an affirmation of their spirit and talents, individually and collectively. It is a tribute to the efforts of those who work with them that their message of peace, hope and love is so wonderfully and meaningfully expressed. Certainly, the audience understood their message, and showed its appreciation of their fine talent with a standing ovation.